The first son but second child of William and Susan, born on the 1st September 1873 (birth certificate number 1873/28186) in Mangawhare an area in the northern Kaipara region, I believe in the town of Aratapu. (Aratapu is a small town on the west bank of the Wairoa River, just north of Tokatoka and was primarily there due to its sawmill). 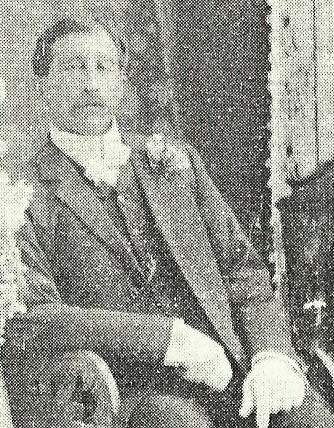 John “Jack” Stanaway at his sister Ida’s wedding 1910. – Tides of Time. We don’t know why but he went by the name Jack, perhaps so not to get mixed up with his Grand Father or his half uncle and the many other cousins and half cousins bearing the same name. Like others in the family with Maori blood in their veins, he was also known as Hone (Maori for John) Haira. I can only assume Haira has been translated from Stanaway. I have only found this surname mention for John and his younger brother Alexander when they played for the 1908 NZ Maori Rugby League team who toured Australia. This incident does not deter the young John from horses it seems that he becomes a skilled horseman. Again in the New Zealand Herald on the 18 December 1893 he came 4th in a horse jumping competition. John and a Mr Wallace were sent back over the fences, to enable the judges to come to a decision in awarding the third prize. The Auckland Star on 7 September 1899, mentions John playing rugby for Aratapu where he scores a try against the Batley football team in Aratapu’s 11 to 4 win. 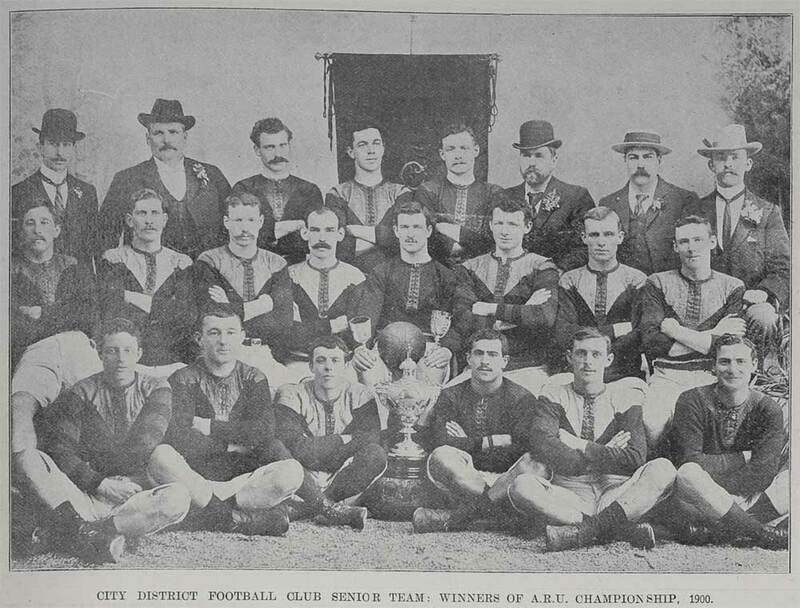 City District football club senior team, winners of the Auckland Rugby Union Championship 1900. – Sir George Grey Special Collections. The Auckland Star on 10 August 1900 listed the Auckland “B” Rugby team to play a match against the Northern Wairoa representatives in Aratapu. John is listed as playing on the wing. John 1900 CIty Football Team – Sir George Grey Special Collections. The WH newspaper on the 13 April 1901 we have John at a athletics met in New Plymouth held on the Easter Monday. Records show he was in two races the 120 yards and the 220 yards. In the In the Sheffield Handicap of 120 yards he comes second in his heat and progresses to the final. Again in the Hibernian sports day on St. Patrick’s Day, March 1902 John enters the following races, 100 yards open, 200 yards handicap and the 300 yards handicap – the results unknown. (Auckland Star 13 March 1902). 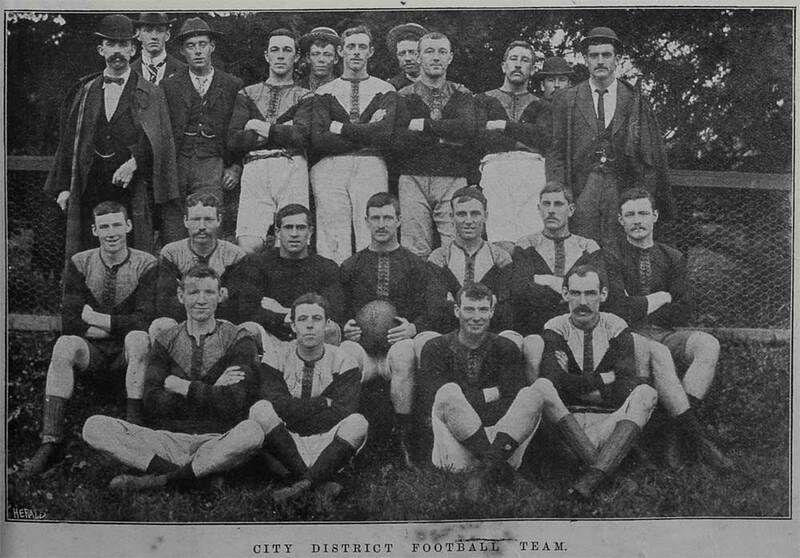 City District Football Team 1900 – Sir George Grey Special Collections. As well as athletics John enjoyed is rugby, he managed to make it into the Aratapu representative team to play a friendly trial against the Ponsonby District senior team in 1903. The New Zealand Herald on the 25 April 1903 list J Stanaway in the forwards. We have recorded in The San Francisco Call on April 10, 1904 John is listed as part of a party of professional athletes passing through on their way to the Summer Olympic Games being staged in St. Louis. It is not clear if John went onto the 3rd Olympic Games. On 13 July 1904 at the age of 31, John marries Eliza Millar at the house of James Miller (her father) which was in Otahuhu marriage cert No 1904/16744) John is listed as a Mill-hand. Eliza was the daughter of James Miller and Caroline Jarvis and was born in Otahuhu. James Miller was a contractor. The Auckland Star on 21 December 1904, lists John in being awarded his jockeys licenses. By 1905 (according to the 1905-1906 Electoral Rolls) the newlywed couple have moved to Clarence Street, Ponsonby in Auckland. His occupation is listed as a Mill-hand – not surprising as this was the main source of work back in his home town and we would assume that he would have worked as a mill-hand there also – mills would have been not far away in Freemans Bay, where at that time, on or about the location of Westhaven there were a number of timber mills. Lennise Stanaway 1910 – Tides of Time. The couple had their first child this year, Lennise Jarvis Susan (Susie) Stanaway, born on the 4 December 1905 (Certificate number 1905/5189) in Ponsonby, Auckland. The birth was proudly announced in the Auckland Star on the 6 December 1905. John is listed as a Mill-hand. Along with this move to Auckland it allowed John to play rugby league for one of the newly formed clubs. He played for the City District Football Club. As well as athletics, rugby and rugby league, John also enjoyed bowls playing for the Ponsonby Bowling Club, and was a founding member of the Pakuranga Hunt Club. On the 15 October 1907 their second child is born, Jack (Kumura) Stanaway (Certificate number 1907/19417) in Ponsonby, Auckland. John is listed as a Mill-hand. 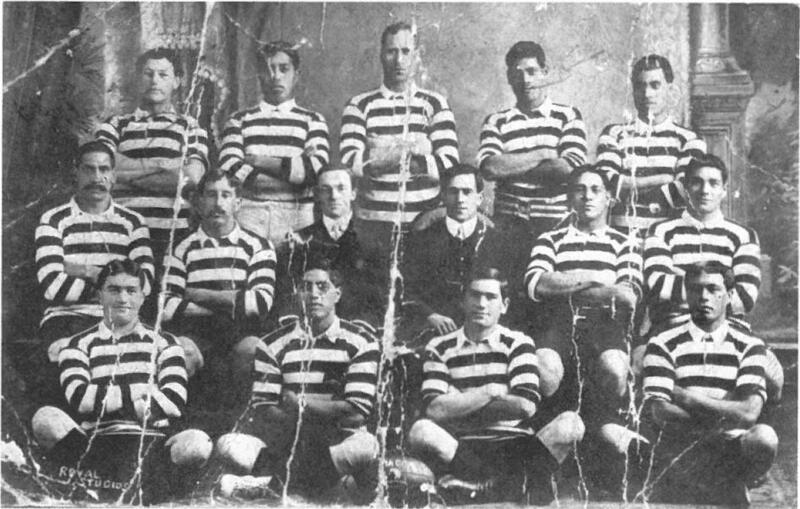 By 1908 John and his younger brother Alexander (back row left) were selected to be part of a professional Maori football team to tour Australia. This was to be the first Maori Rugby League team formed and to go on tour. 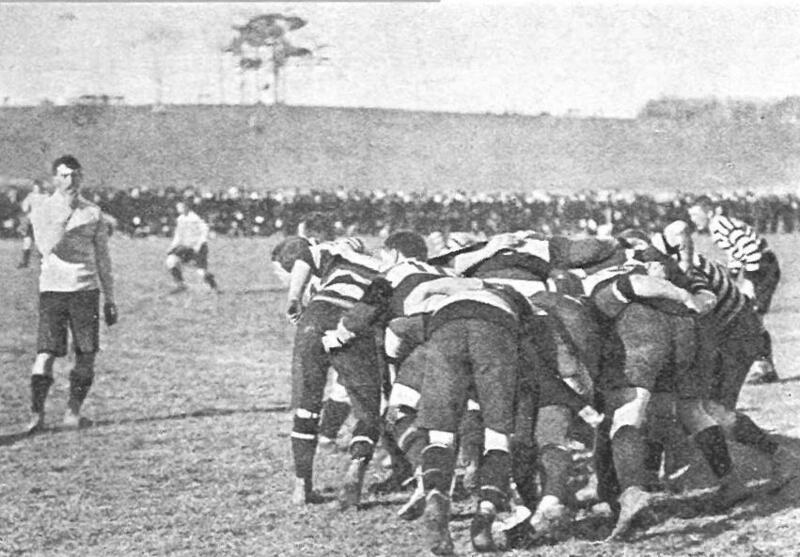 1908 NZ Maori RL Team – 100 years of Maori RL. Notably on this tour John scored a try against the Australian side. John was thirty five by the time of this tour, and by this time his playing days were coming to an end. He soon after this tour turned his attention to refereeing as the new game became established. He did accompany two further tours but this may have been as an official or as part of the coaching staff. At Ponsonby United’s first AGM on 30 July 1909, Jack was elected to the club’s executive alongside James Carlaw (the first Chairman), Charles Dunning and Arthur Carlaw. Jack became a referee in the Auckland Rugby League competition. On 25 June, during a club game, he sent off Albert Asher. The rest of the City Rovers side walked off in support of Asher. Asher became the first player to face the ARL judiciary, who cautioned him. John was to referee of the first test match played on New Zealand soil, at the Auckland Domain Cricket Ground when the Great Britain Lions toured in 1910. He also controlled the Lions matches against Auckland, in which his brother Alexander played. In that same year, 1910, John attends his younger sisters, Ida’s wedding and is part of the wedding party. (Refer to Ida’s wedding photograph, his daughter Lennise was a flower girl). By 1911 John and Eliza have moved to Portage Road in Otahuhu, Auckland (according to the 1911 Electoral Roll) his occupation is listed as a “Yardsman”. In 1911 he helped set up the Otahuhu Rovers club, becoming their first chairman. 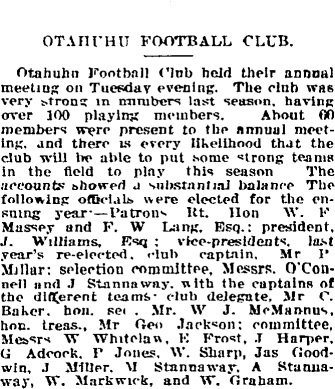 The 1915 Otahuhu Football Club annual meeting, mentions three Stanaway brothers, John is part of the selection committee and his brother Alexander and Montrose are both and the club committee (Auckland Star 24 March 1915). Hone Haria – Athlete & Footballer. 100 years of Maori RL. With the outbreak of World War 1 most able body men were required to serve in either active service or on the reserve roll. John in 1917 was listed on the Reserve roll D Second Division Auckland. He never saw active service. Interestingly in the 1919 Electoral Roll has John and his wife still at Portage Road, Otahuhu, but this time his younger brother Alexander and his wife are registered at the same address – we do not know why this is. Tragedy strikes on 24 May 1922, his dear wife Eliza passes away. It is not known if Eliza was buried or cremated, no records could be obtained. Ellen (Helen), his older sister appears to have been very fond and close to her nearest sibling, his headstone has a message from her on it stating “Always remembered By Ellen”, and in 1932 she inserts an in memory notice. 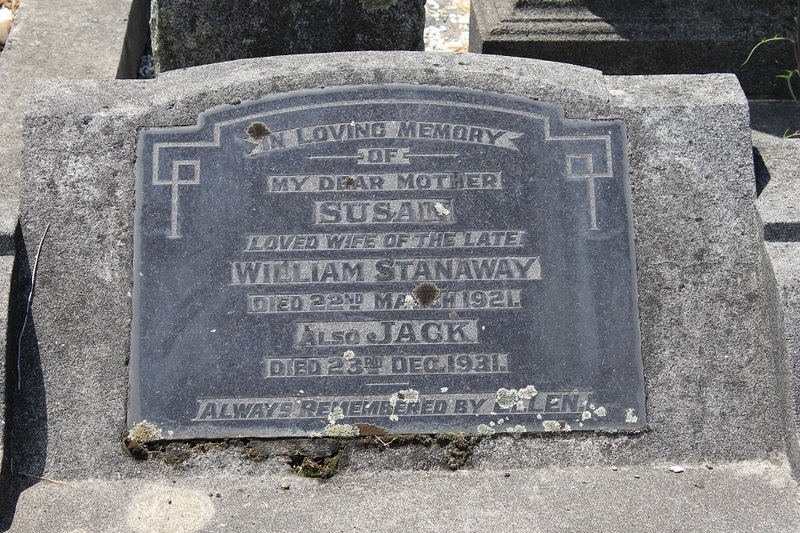 Susan’s and her sons Jack’s grave in Otahuhu Cemetery. Note that the year was not correct, it was the same for the Obituary she placed the year earlier. Greg, I remember Auntie Len (Lennise Javis Castle nee Stanaway) saying that she was not allowed out by the stockyards when they lived in Portage Rd, because of the language the men used, but she used to sneak out there anyway. Her Dad JJ was working for the freezing works close by or at least something to do with the sheep and cattle coming to the yards. There is a train station at the bottom of Portage rd and I presume stock came in by rail at that stage. She also said, my Dad,Jack, used to hide behind her, I guess using big sis as protection. Dad only told us he had a fairly rough upbringing, being struck and shut in a box if he broke the rules. But he never raised his hand to us, his children.